It’s time for another deck guide, and this time an awesome arena 3 deck that I have had lots of success with. In addition to being a good deck, this is also a really fun one to play, so definitely check it out. It contains many of my favourite cards, like the Spear Goblins and Archers. I’ve also chosen to use the Prince here, as the Prince is still a very good card, even after the recent nerfs in the March 23. update. The only nerf of the Prince was making his charge a little slower, and that’s not a big deal when it comes to this deck. I’ve played this deck a lot the last couple of days and it works really well. I’ve tested a lot of combinations of arena 3 and lower cards to come up with the best deck possible, so I’d love to hear what you guys think of it. Please leave a comment if you have any questions or thoughts about the deck. In this deck there are 4 epics, but all apart from the Prince can be replaced and the deck will still work pretty well. You can check out the replacements I would suggest here here. 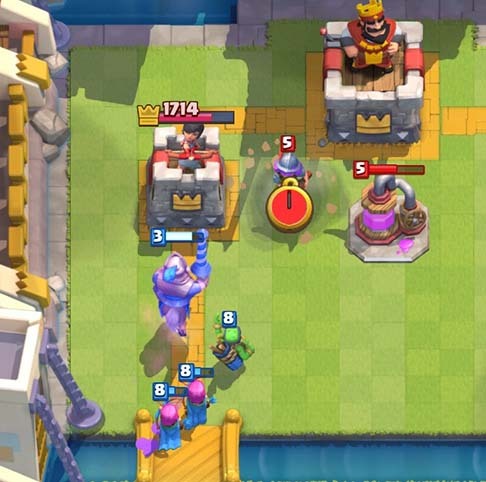 The Prince is usually the first tower killing troop new players get access to. It’s also the first card most people learn how to counter however, so you have to place it well when you’re using this deck. 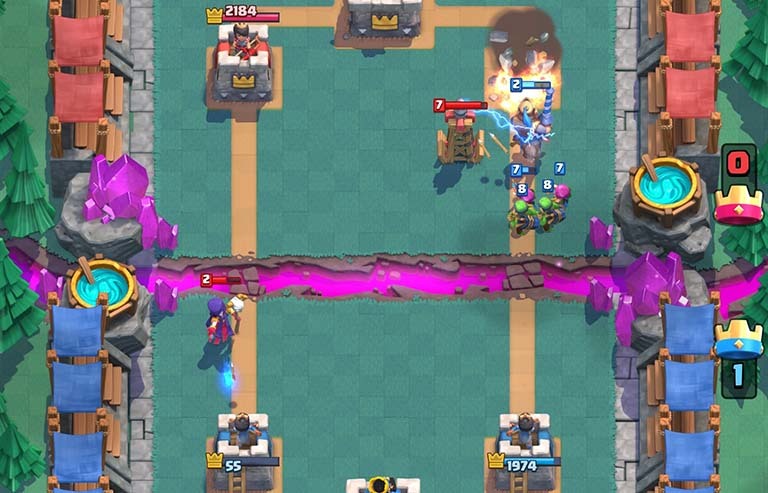 Usually you should play the Prince when your opponent is low on elixir so that he can get to the enemy tower without being distracted. The Cannon is a really good defensive card at only 3 elixir. I know it says 6 elixir on the image up there, but I’m just too lazy to change it now. The cannon got a small nerf in the recent update, the duration was decreased from 40 to 30 seconds. However, the Cannon is usually killed before the duration runs out so it’s not that big of a deal. Archers used to be good, and with the recent balance patch they are even better. What was changed in the patch was the time it takes from when they are played until they make their first attack. Now the Archers attack right away just as the Spear Goblins do. Archers are great at both air defence and backing up your Prince at attacking the tower. The Baby Dragon is one of my favourite cards and is an important part of this deck as well. The Baby Dragon made #1 on my recent post about the Top 10 cards of Clash Royale. I’ve stopped using the Baby Dragon in all of my decks like I used to, however in this deck it works very well. It takes care of enemy flying troops and also does good splash damage to enemy ground troops. Goblin Barrel is a nice card for dealing some extra damage to the enemy tower. I don’t use the card that often, just in the right circumstances. That would be when your opponent has just used his arrows or is very low on elixir. This deck doesn’t use arrows, so a fireball is really needed then. I’m sure everyone knows how to use Fireball so no more explanation is necessary here. The Spear Goblins are awesome and I think they are in almost every single one of my decks. They are cheap, move fast and can target both air and ground. Here are my suggestions for card replacements. Everyone always asks about this, so I’ve made of list of which cards I think you should replace your missing cards with. 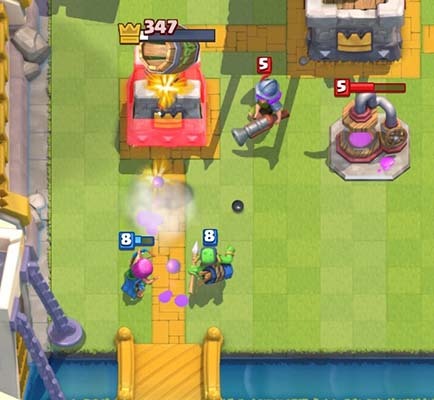 Cannon can be replaced by Bomb Tower or Tombstone. Goblin Barrel can be replaced by Lightning. As for most of my decks my standard opening is the Spear Goblins. The Spear Goblins are cheap and gives me time to see what my opponent is doing. I can follow up the Spear Goblins with more troops or I can focus on defending my other lane instead. If I don’t have Spear Goblins in my starting hand I will usually go for the Cannon. The Cannon is a cheap defence and does well against all ground troops. It also does well at distracting incoming flying troops. 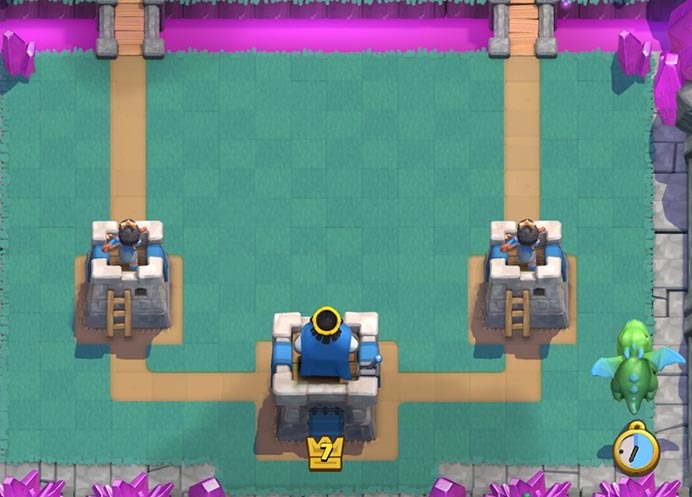 You will place your Cannon in the middle of the area in front of your King Tower. 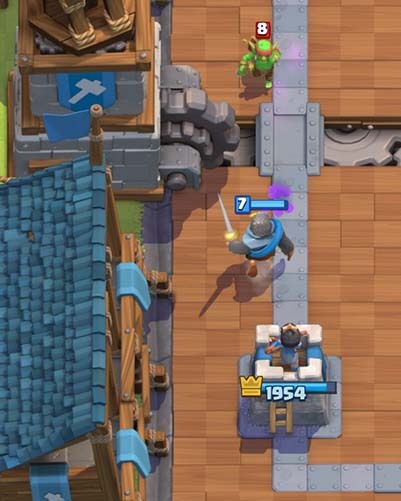 When you place him here he will distract troops coming in from both lanes, and your own towers will be in range so they can shoot at the troops that are hitting the cannon. I also often start with the Baby Dragon. The Baby Dragon does pretty well on his own, there is not really any way for your opponent to counter the Baby Dragon and come out on top. If he reaches the enemy tower he will do several hundred damage to it depending on his level. If you don’t have any of the cards I’ve already mentioned, which would be very rare, you could start with the Knight. Just like the Baby Dragon the Knight is very hard to counter. If he gets to the enemy tower he will do a lot of damage to it. The Midgame is all about playing smart and being patient. 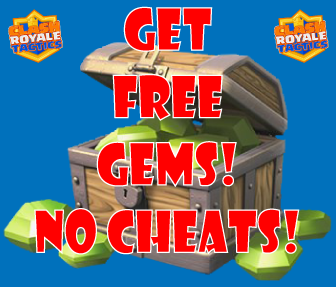 Don’t overcommit on your attacks and run out of elixir, be patient and keep defending and make smart counter-attacks. It’s tempting to go all in early but that can easily come back to bite you. Pay attention to your opponents cards so that you will notice when he is low on elixir. When you have successfully repelled one of your opponents attacks and think that he is low on elixir, it is time to make your move. The strongest push of this deck is the Prince with Archers or Spear Goblins behind him to back him up. In the situation below the Prince together with the Archers completely took out the tower. If the Prince is not countered it can take out all of the tower even solo. You don’t have to kill any of the enemy towers during the midgame. In most cases that won’t happen. As long as you get them down to half health or so you are doing really well, especially of you have most of the life left on your own towers. 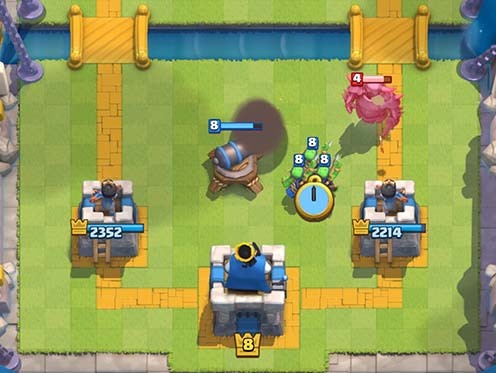 The most important is that you keep a Cannon up at all times and don’t let your opponent get easy hits on your tower. How low you get the enemy towers during the midgame will decide how aggressive you should play during the endgame. In general you will take more risk and play more aggressively the more behind you are. If you have already lost a tower and time is running out, you have to go all in and risk losing everything to get to overtime. 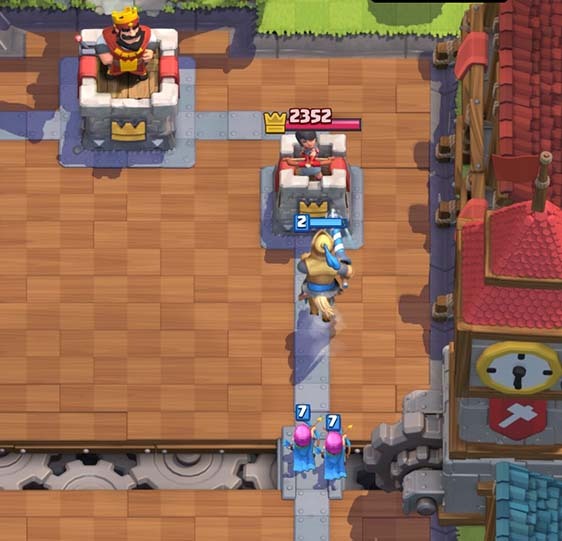 In the game above I saw that my opponent would easily take out my left tower so I had to go all in a push for his right tower. Here you can see the Prince, Archers and Spear Goblins push. The combination of these low elixir ranged troop shooting over the Prince at the enemy tower works really well. Here is another similar rush. The Prince in front of smaller ranged troops is really strong. You can also follow up with Goblin Barrel if needed. In this case the goblins from the barrel took out what’s left of the tower. All in all this is a quite easy deck to learn how to play and also a lot of fun. This is one of the decks I’m currently playing in Arena 7, so you can use this deck to climb really high if you want to. If you decide to test the deck out, please let me know how it goes by leaving a comment. Also feel free to ask if you have any comments or other thoughts. What should i use if i dont have both baby drag and the witch? Thanks for the help. Jesus bless you. Well it depends how you play it, also check out the newer decks here. If I’m being honest, as long as you use this deck correctly it’s great. Possibly one of the best decks I’ve used. I’ve climbed from 780 to about 1000 in a few battles. Great deck, thanks alot. What do you mean by “correctly”, like defensively, offensively, etc. ?